OUR LADY OF THE PILLAR COLLEGE -CAUAYAN, Inc.
President: Dr. Exuperio V. Flores, Jr.
Fr. Roque N. Fidel, then parish priest of Our Lady of the Pillar Parish, founded OLPCC in 1956. It started as a secondary school with Mr. Vicente Talosig as Principal. The original site of the school was a two-storey building at the Parish Church compound. In 1979, a two-hectare lot was donated to the Roman Catholic for educational purpose, particularly the possible expansion of OLPI to tertiary level of education. It was during this time that Msgr. Marino D. Gatan, then parish priest and OLPI director, started applying for authority to offer college courses. After sometime, Our Lady of the Pillar Institution opened its College Department offering Bachelor of Arts in Sociology in 1979. in 1980, it started Bachelor of Science in Business Administration major in Accounting. That same year, the school opened its kindergarten which prompted the transfer of the senior high school students to the new OLPI site. In 1984, the pioneers of the college department graduated. Today, they are now employed in various establishments in the city and elsewhere, proving that OLPCC had trained and prepared its students for the world of work. The following year, OLPCC scored a milestone achievement when its students garnered 100 percent passing rate in the Licensure Examination for Certified Public Accountants (CPAs).To answer the current need for high level education and professional competencies and to make Pillarican catholic education more responsive to the needs of the time, particularly the community and industry, OLPCC offered new courses such as Bachelor in Secondary Education (BSEd), Bachelor in Elementary Education (BEEd), majors in Science and Mathematics, Computer Courses, and additional majors in Bachelor of Arts, and Bachelor of Science in Business Administration. In 1996, OLPI became a member of the Philippine Association of Colleges and Universities (PACU) which paved the way for the opening of its graduate courses in Master in Business Administration, Thesis and Non-thesis programs, Master of Arts in Educational management, Master in Public Administration and Bachelor of Science in Information Technology. In the succeeding years, Engineering, Criminology and Nursing programs were offered. Little By Little . . . One By One . . . The continued increase in enrolment boosted monumental changes in the college – a three-storey building is now occupied by the College Department and a new three-storey building by the grade school and the Nursing Department. The existence of modern and highly advanced physical facilities of Science and Computer Laboratories and access to the Global community through the Internet are in place for better learning. 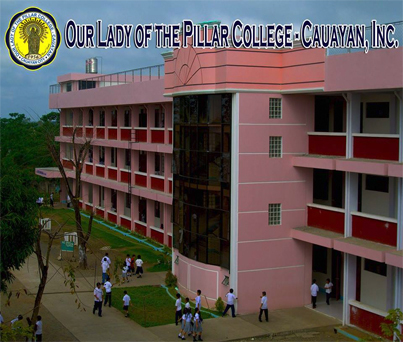 In 2000, the institution was renamed Our Lady of the Pillar College – Cauayan. In the course of time, instruction, facilities and infrastructure were improved. The high school department now moved to its new site – the Father Fidel Campus located just a few meters away from OLPCC Fronie Campus. This was blessed by Archbishop Antonio Franco, Papal Nuncio to the Philippines, on August 20, 2002 and was formally inaugurated by Rev. Bishop Sergio L. Utleg, Bishop of Ilagan on December 8, 2002. The increasing number of students flocking to OLPCC challenged the administration to make a gargantuan leap from mere semi-permanent infrastructures to well-furnished buildings, speech laboratories, science and physics laboratories, audio visual room, media center, computer laboratories, libraries and nursing skills laboratories. With deep concern for quality and excellence, OLPCC was granted level II accredited status by the PACU-COA on October 15, 2002 in the Accountancy and Education programs and was also granted level II accreditation status in the Business Administration program in 2005. The High School Department was also granted level II accreditation status after meeting the requirements set by the PAASCU. Responding to demand of the times, OLPCC expanded further its programs by offering nursing, Engineering and Criminology courses. With keen competition in the world of work, OLPCC strives further to render services necessary and relevant to make education affordable and accessible without sacrificing quality and excellence to the less fortunate members of the community. To accommodate the growing number of students, OLPCC constructed a separated building for the College of Nursing. The rooms and Nursing Skills laboratory are equipped with the most modern facilities and equipment. Today, OLPCC is not known for its majestic buildings and top rate facilities, but also its quality of instruction, competent faculty members and Christ-centered curriculum. It is consistently producing board topnotchers and passers in Accountancy, Criminology, Education, and Nursing board examinations. Truly, OLPCC has emerged as the pride of Cauayan City and Cagayan Valley. The Our Lady of the Pillar College – Cauayan is at present moving forward in attaining its mission and vision. Being the only Catholic and accredited college in central Isabela, it is living up to her mandate as the evangelical arm of the Diocese of Ilagan. It continues to produce quality and transformed graduates who are now working in different offices and agencies locally and abroad. The new breed of nurses that are produced are highly skilled, competent and globally competitive. The physical plant and structures are designed to cope up with the demands and requirements as set by government for utmost safety of all students and employees. With a meager annual income derived solely from what the students’ pay, OLPCC slowly is becoming an educational complex that is highly technical and very accessible but deeply rooted in FAITH IN GOD – being dedicated to Mother Mary, Our lady of the Pillar. While the process of accreditation in all levels and courses is in progress, the facilities are constantly upgraded and modernized, instruction is truly student-centered, curricula are constantly reviewed and revised to suit the demands of industry and community and faculty members are highly educationally and morally qualified with exceptional care and concern for students’ welfare. In the midst of all these, OLPCC’s presence in the community is strongly felt even in the most depressed barangays. The outreach program at barangays San Pablo and San Isidro in Cauayan City, Isabela are monumental undertakings that will reshape and transform the people in the community at a pace faster than expected. The unselfish efforts of faculty and students are forms of self-denial and preferential option for the poor.